The song in question is – Song Of A Devil’s Servant by The Golden Earring from their 1969 album, Eight Miles High. If you don’t like hitting links to donate money online, search Google for “donate japan red cross” and you’ll see the link for yourself. Just listened to your June show podcast — first ever for me. Wonderful! Almost too much fun for my delicate frame. I LOVE Sonny & Brownie. Some great stuff new to me, too. I have an interesting story of coincidence about the timing of that show and my trip to Woodstock in early June. You recorded the show on June 4th. On that day my wife Tanya and I were in Woodstock. Two days later, as we were driving back to Ohio and listening to my cassettes, I pulled one out and played it on the off chance that Tanya might like it. It was Sonny Terry and Brownie McGhee, and sure enough, Tanya, an avowed blues refusenik, actually liked it. And Sonny & Brownie was how I searched iTunes and found your podcast. Fun story, huh? By the way, Jim, did you used to Crap From The Past? Your voice sounds very familiar. Hey man, that’s cool. Yea, that Brownie & Sonny came right off the vinyl on the Olympic label. Picked up that LP at the local flea market down the road! Glad we could find something your wife would like! I was not a part of the “Crap…” radio show to which you refer. We’ve been doing this show over shortwave radio & internet since 2001. It amazes me the music you have in your library. You must constantly be on the lookout for rare music and spoken word records. I’ll be out here listening! Hey, Jim E Night, just wanted to let you know the Morrisons are listening from Florianopolis on the Island of Santa Catarina in BRAZIL, also known as MAGIC ISLAND! Great show so far! Wanted to surprise you with a call via Skype but your phone system declined the call…. ‘sup with dat?! Something about caller ID not enabled. Duh. We are diggin the tunes while “watching” the Lost Discs Radio Show on itunes visualizer. Cool! TURN IT UP! We can hear it all the way in Brazil! Say Happy Birthday to Julie! Really dig the show Jim E. Listen to it on my Ipod at work. Unfortunately can’t get it on the short! Anyway, REALLY dug the Oct. 31st 2011 show (just heard it for the first time), #270. Loved the opening song and fell for Chesty’s pick of the week! All the other stuff was great too! You guys scored finding that stuff. Can’t find a copy of Wool anywhere! I want that 45 damnit! OMG, I’m glad to see you guys are back in business–whoo, hoo!!!!! Jim E., Dokka Doc, Joe Stax, Chesty–I love all of you guys 🙂 Keep playing those moldy oldies, I can’t get enough of them! If any of you guys watch corporate TV, you might remember me from last season’s America’s Got Talent where I went to the semi-finals as the Kinetic King. Unfortunately, my kinetic art is mostly visual so it won’t work over the radio. 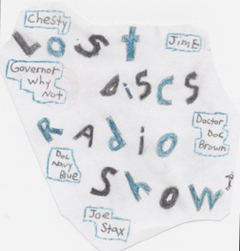 However, if you guys want a cool exploding-stick logo for the Lost Discs (with a ‘C’) website, gimme an e-mail. Anyhoo, keep up the great work and stick it to the Man, man! Hey, Guys–Awesome job on the 11th anniversary special, and thanks for the shout-out! That’s really weird to know there’s a group called Kinetic Energy and that they’re also from the Midwest. Whoo, hoo! Hey, Guys–I almost forgot to do a link to your awesome show on my Facebook page, but I’ll be doing a link right now. Hopefully that should bring in some new listeners. Keep up the great work, guys, and keep sticking it to the man, Man!